Born in Leningrad, October 30, 1940. School training 1948-1958. Graduated from the Moscow State University in 1965, Biological-Pedological Faculty, Chair of Entomology. Working at the Paleontological Institute, Russian (formerly USSR) Academy of Sciences (Moscow) as a technician (since 1958), junior research worker (since 1969), research worker (since 1986), and senior research worker (since 1989 till now) in Arthropoda Laboratory. PhD from that Institute, 1980. Having 62 publications, mostly on the paleontology, taxonomy and phylogeny of Trichoptera and Mecoptera, and also on the entomofauna of recent and fossil resins. Among them one personal monograph and three multi-authored books. SUKATSHEVA I.D. 1968. Mesozoic caddisflies (Trichoptera) from Transbaikalia. Paleontol. Zhurn., 2: 59-75 (in Russian). ZHERIKHIN V.V., SUKATSHEVA I.D. 1973. On the Cretaceous insect-bearing"ambers" (retinites) of North Siberia. In: Voprosy paleontologii nasekomykh. Doklady na XXIV ezhegodnom chtenii pamyati N.A. Kholodkovskogo, 1-2 april, 1971. Leningrad, Nauka Press: 3-48 (in Russian). VIALOV O.S., SUKATSHEVA I.D. 1976. Fossil caddisworm cases (Insecta, Trichoptera) and their stratigraphic significance. In: Kramarenko N.N. (ed.). 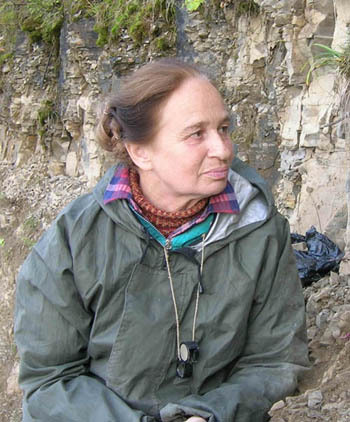 Paleontology and biostratigraphy of Mongolia. Trans. Joint Soviet-Mongolian Paleontol. Expedition, 3. Moscow, Nauka Press: 169-232 (in Russian). SUKATSHEVA I.D. 1980. Scorpionflies. Caddisflies. moths and butterflies. In: Rohdendorf B.B., Rasnitsyn A.P. (eds.). Historical development of the classis Insecta. Trudy Paleontol. Inst. USSR Acad. Sci., 178. Moscow, Nauka Press: 101-104, 104-109, 110-112 (in Russian). SUKATSHEVA I.D. 1980. Evolution of caddisfly (Trichoptera) larval case construction. Zhurn. obshchei biologii 41: 457-469 (in Russian). SUKATSHEVA I.D. 1982. Historical development of the order Trichoptera. Trudy Paleontol. Inst. USSR Acad. Sci., 197. Moscow, Nauka Press. 112 p. (in Russian). ZHERIKHIN V.V., SUKATSHEVA I.D. 1989. Patterns of insect burial in resins. In: Sokolov B.S. (ed.). Sediment cover of the Earth in space and time. Stratigraphy and paleontology. Moscow, Nauka Press: 84-92 (in Russian). KULICKA R., SUKATSHEVA I.D. 1990. Rodziny kopalnych Trichoptera mezozoiku i kenozoiku (Mesozoic and Cenozoic families of Trichoptera). Prace z zakresu badan nad bursztynem baltyckim. Prace Muz. Ziemi (Warszawa) 41: 65-75. ZHERIKHIN V.V., SUKATSHEVA I.D. 1990. Caddisfly cases as stratigraphic tools in the Cretaceous. In: Krassilov V.A. (ed.). Continental Cretaceous of the USSR. Vladivostok: 19-29 (in Russian). SUKATSHEVA I.D., RASNITSYN A.P. 1992. The first extinct representatives of the family Boreidae (Insecta, Panorpida = Mecoptera) from the Upper Jurassic in Mongolia and Lower Cretaceous in Transbaikalia. Paleontol. Zhurn. 1: 126-129 (translated into English in Paleontol. J. 1992, 26(1)). WIRCHARD W., SUKATSHEVA I.D. 1992. Kücherfliegen des Baltischen Bernsteins. 3. Litax herrlingi n. sp., eine fossile Art der Goeridae (Insecta, Trichoptera). Mitt. Geol.-Paläontol. Inst. Univ. Hamburg, 73: 217-222. NOVOKSHONOV V.G., SUKATSHEVA I.D. 1994. New genus of caddisflies (Insecta, Trichoptera = Phryganeida) from the Upper Permian of Kazakhstan. Paleontol. J. (1993), 27(1A): 166-168. SUKATSHEVA I.D. 1994. Oldest Polycentropidae (Trichoptera) from Mongolia. Paleontol. J. (1993), 27(1A): 192-196. NOVOKSHONOV V.G., SUKATSHEVA I.D. 1993. Early evolution of caddisflies. Proc. 7th Int. Symp. Trichoptera. Leiden, Backhuis Publ. : 95-100. SUKATSHEVA I.D. 1994. Upper Jurassic caddis cases from Mongolia. Paleontol. Zhurn. 4: 126-129 (translated into English in Paleontol. J. 1994, 28(4)). NOVOKSHONOV V.G., IVANOV B.D., SUKATSHEVA I.D. 1995. New Jurassic caddis flies caddisflies (Insecta, Trichoptera = Phryganeida) from Siberia and Mongolia. Paleontol. J. 28(4): 157-163. SUKATSHEVA I.D., ESKOV K. YU. 1995. Geographical distribution of the Paleozoic and Mesozoic caddisflies (Insecta: Trichoptera). Abstr. VIII Int. Sympos. Trichoptera Minneapolis, Univ. of Minnesota: 29. SUKATSHEVA I.D. 1999. The Lower Cretaceous caddis case assemblages (Trichoptera). In: AM/PFICM98/1.99 - Proceedings of the First Palaeoentomological Conference, Moscow, 1998, p. 163-166, Bratislava. SUKATSHEVA I.D. 2001. New representative of Philopotamidae (Trichoptera) family from the Upper Cretaceous of Kazakhstan. Prace Muz. Ziemi. 46: 65-66.